AS A MECHANICAL COUNTER the photoelectric cell is virtually infallible. 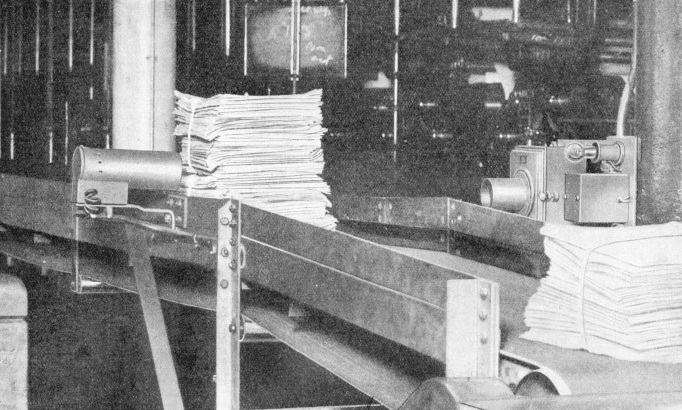 In a newspaper office, for instance, parcels of newspapers pass along a conveyor for dispatch. A light source is mounted on one side of the conveyor and a cell on the other. As the parcels pass they interrupt the ray of light and each interruption is duly recorded by the photoelectric cell. THE photoelectric cell is the magic lamp of the twentieth century. Its applications have penetrated into every branch of modem industry and into the everyday life of the general public. In the course of a day the man in the street is subject in many ways to the control and assistance of the photoelectric cell, probably without once being conscious of the fact. He may dial TIM on the telephone to learn the exact time. The phantom voice which announces the hour is made possible by the cell. Traffic at the pedestrian crossing is halted at his approach by the same means. At the underground railway station the vociferous request to “move along, please” is issued through the medium of a photo-cell. The closing of the lift doors may be at the dictate of the cell. If he visits the cinema, he is doubtless unaware that the cell is responsible for the speech and music. These are useful applications, but it is in the wider field of engineering and general industry that the cell performs the most valuable service. It is essentially unobtrusive, yet it lends itself to the control of spectacular enterprises. In 1933 the American Century of Progress Exhibition was opened by a ray of light from the distant star Arcturus. The beam was focused on to a photocell, which switched on the lighting system of the whole vast scheme. A rough calculation shows that the ray of light which performed the ceremony had left Arcturus over forty years before, travelling continuously at a speed of 186,000 miles a second. The theory underlying photo-electricity and the laws governing the electron emission are complicated, but the practical results obtaining from the effect are easily comprehensible. The cell enables a beam of light to be translated into an electric current. However rapidly the beam of light may fluctuate, the current from the cell will vary in direct proportion, faithfully and instantaneously. The current obtainable from a photoelectric cell is small, amounting to no more than sixty or seventy microamperes (millionths of an ampere) per lumen. Because of the efficiency of modern valve amplifiers, this low current limit is of no consequence, as the output can be amplified to any degree. With the exception of those used for television purposes, the photo-cells of differing manufacture are all approximately of similar size and closely resemble a small radio receiving valve. For most jobs a single valve amplifier only is necessary, so that cell and amplifier can be mounted in a neat cast-iron container of small dimensions. In the factory the light-sensitive cell is performing valuable service. Power presses and guillotines, for instance, are extremely dangerous machines, even when normal shielding precautions have been taken. A guard cannot completely surround the danger points, because the operator must have access to them to control the work. Protection in such instances is a job which the photo-cell is peculiarly suited to undertake. Light is unobtrusive, takes up no space and has no inertia. A light source is arranged on one side of the machine and the cell on the other. The beam of light is the safety barrier. Immediately the operator’s hands move into the danger zone, he interrupts the beam of light, which causes the photo-cell to stop the machine. One or more danger spots can be guarded by reflecting the light ray by mirrors all round the machine, finally focusing on the photo-cell. Another attribute of the photoelectric cell, when used for industrial purposes, is its superhuman efficiency as a counting or inspection device. 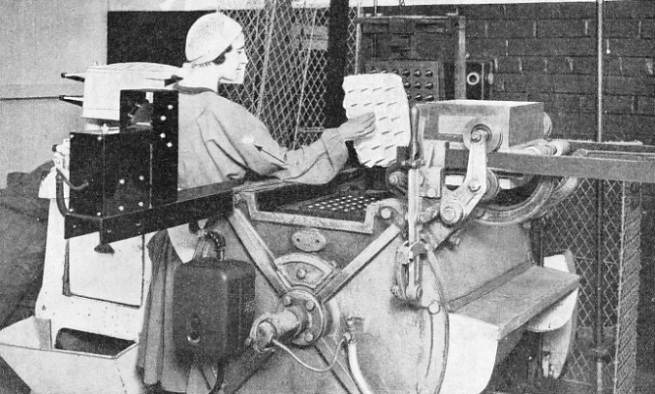 Packages and goods arranged on a moving belt conveyer are counted far more rapidly, and with less likelihood of error, by the photo-cell than by man. Here again, the principle is to mount a light source and a cell on opposite sides of the conveyer. Each interruption of the light ray is duly recorded by the cell, the number of packages automatically being recorded on a mechanical counter. Inspection of products by photoelectric means is a science in itself. The goods that can be inspected range from motor car components to textiles, whose colours can be checked and tested by these means. In applications of this type, advantage is taken of the reflecting properties of the item undergoing examination. Cloth of a given quality, dyed a certain colour, will have a certain “reflectance”, governed primarily by the colour. Another piece of similar material can be matched up with it exactly by checking up this reflectance factor with a photo-cell. Grading products according to size is a task which the cell is often called upon to perform. Beans, eggs or bearing balls may all be accurately and rapidly sorted by photoelectric equipment. The printing industry also owes much to photoelectric control. Equipment is installed to “watch” the paper on huge rotary presses. A breakage of the paper is instantly detected and the machine shut down, an alarm sounding simultaneously. High-speed production in the newspaper world has necessitated photographs being available at the central office within a short time of the occurrence of the event they record. Photographs can be sent over telephone wires or by radio only through the services of the photo-cell. In the transmission of pictures by wire, the photograph is wrapped round a cylindrical drum. A thin beam of light is focused on to the picture, whence it is reflected back on to a suitably placed light sensitive cell. Dark portions of the photograph absorb most of the light reaching them, but high lights reflect on to the cell a large proportion of the illumination they receive. AUTOMATIC OPENING OF A DOOR can be achieved by the use of a photoelectric cell placed a short distance in front of the door. 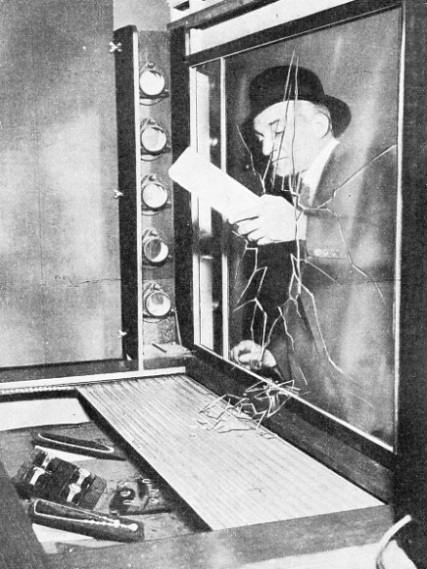 When a person approaching the door interrupts the light-ray the photo-cell sets mechanism working to open the door. 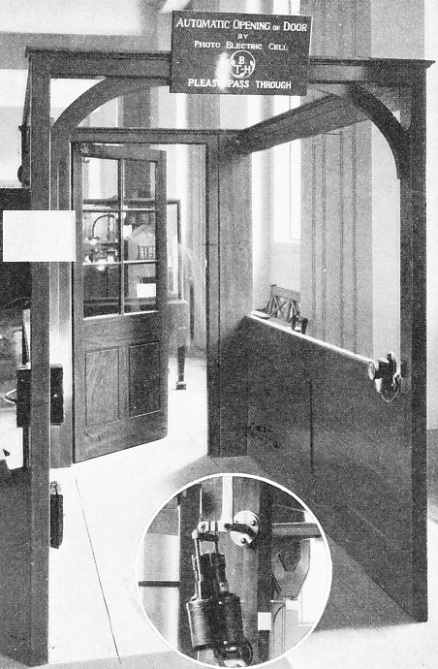 In the circle at the bottom of the picture is shown the mechanism which delays the shutting of the door for a predetermined length of time. Because of the cell’s ability to translate light changes in terms of electrical energy, the picture will be resolved into a series of current pulses. These can be sent by land line or radio in the normal way. At the receiving end, the impulses are caused to modulate a neon lamp which will provide illumination in direct relation to the received current. The light obtained in this manner is allowed to fall on photo-sensitive paper wrapped round a drum similar to that at the transmitter. The transmitted picture is scanned in a series of little elements, taken in sequence. At the receiver, exactly the same sequence must be observed and transmission and reception must be perfectly synchronized. With the observance of these provisos, the received picture suffers little loss. Before the advent of the direct scanning television camera, the photo-cell was widely known as “the electric eye”. This title has now been usurped by the electron camera, because it has the better claim to the title. Despite this, the term was a happy one for the photo-cell, as in so many of its applications it performs a task formerly carried out by human eyes. It is ideally suited for watching possible means of ingress in shops, offices and public buildings. By the choice of suitable light-sensitive materials, the source of illumination can be in either the ultra-violet or infrared regions of the spectrum. Either of these regions is outside the range of human visibility. Thus an intending intruder has no foreknowledge of the protective device. One of the most effective methods is to arrange, by a series of mirrors, for the light beam effectively to cover the whole window area in a zigzag fashion. So sensitive is this system that a brick thrown through the window will interrupt the ray and cause the alarm to be given. Jewellers are adopting this scheme, combined with further equipment which causes all trays of jewellery to be automatically lowered into safety as soon as a window is smashed. A considerable amount of time and labour is saved in restaurants by installing photoelectric equipment to control the communicating door between restaurant and kitchen. About three feet from the door the cell and light source take up their position. A waitress making her way out to the restaurant with laden tray finds the door already wide open for her. Interruption of the beam is all that is necessary to set the door-opening mechanism in operation. Devices of a similar nature are frequently met with in factories. Smoke-abatement measures enforced by local authorities necessitate a knowledge of the kind of smoke passing up the chimney. Not only for aesthetic and hygienic reasons is the minimum of smoke essential, but also for the sake of economy. The cell is therefore used to provide an indication of the smoke density. The heavier the smoke, the greater will be the screening effect on the cell. Thus the smoke density is directly related to the current passing through the cell, which is recorded on a suitable meter. PRECAUTIONS AGAINST BURGLARY from a jeweller’s window often consist of an alarm system operated by photoelectric cells. As soon as the window has been broken the light rays are interrupted. The alarm is automatically given and immediately the trays containing the jewellery sink to safety. The ability of the caesium (an alkali metal) photoelectric cell to “see” the invisible infra-red rays offers one of the most likely methods of overcoming the fog menace. Infra-red rays are entirely unaffected by fog, so that, with the aid of suitable beacons and the cell, a course could be followed through the densest fog. One of the great virtues of the human eye, its adaptability to slowly changing illumination, is also a source of danger. When one is engrossed in a job the gradual falling off of daylight illumination often passes unnoticed until eyestrain is felt. The control of illumination provides another important sphere of application for the photo-cell. Particularly in schools and factories where good illumination is important, the cell is arranged to switch on the lights immediately a certain minimum level has been reached. One lamp, or the lighting system of a whole town, can be controlled by a single photo-cell. The photo-cell specializes in high-speed timing operations. Horse and greyhound racing tracks make use of the cell for determining the time in which a race was run. Used with an automatic cinecamera, the cell can help to provide not only the time, but also an indisputable record of the finish, which is of great assistance to judges in instances of apparent dead heat. The possibilities of the photo-cell for high-speed timing have not yet been fully exploited. By the use of two cells and two light sources, extremely accurate records can be achieved. The procedure is to arrange for interruption of the first beam to start the charging of a condenser. Interruption of the second beam stops the charge. The distance between the two beams is known, the charging rate of the condenser is known and the final charge can be measured, thus providing an indication of the speed. The rate at which the head of a golf club is travelling just before impact with the ball has been measured by this method. Railway signalling systems can be controlled by photoelectric means, although this presents a number of difficulties. In Germany a complete system was evolved and tested successfully, but the scheme does not appear to have been extended elsewhere. Factors such as the train’s forward motion, its sideways movement and the presence of tunnels all introduce troubles for the designer. The basic requirements are that the locomotive should, while in motion, somehow receive a signal that the driver cannot normally overlook. If he does overlook the signal, then automatic control should bring the train to rest. The photo-cell can do all this if the beam of light can be made to reach it at the correct instant. Further, the cell must not be affected by any light other than the special signal ray. In the German scheme, a specially shaped reflector on the signal post at the side of the track, coupled with elaborate screening arrangements for the cell, enabled the job to be carried out satisfactorily. A piece of metal when heated passes through a complete range of colours from red to white heat. In the interval between these two stages, temperature changes, as represented by the colour, are not easy to detect by eye with any degree of accuracy. On the other hand, many industrial operations must be carried out at a given temperature, and for assessing this temperature the photocell is well fitted. In an American automobile works, for instance, cells are installed in conjunction with electric heaters, to watch the temperature of steel which is to undergo forging. Immediately the correct temperature is reached the ingot is ejected from the heater at the cell’s indication. A considerable speed-up in the time occupied by the operation was made possible by the scheme. The use of the photo-cell is by no means confined to the control of industrial operations, although it is presented with more opportunities for the solution of practical difficulties in this sphere than in any other. Civil engineering practice normally avoids dependence on electrical control, but an example of the successful combination of civil and electrical principles is afforded by the Kincardine-on-Forth Bridge, completed in the autumn of 1936. This swing-span structure is a splendid bridge. The swing-span is controlled electrically, and a photo-cell ensures its accurate alinement. Spanning the Firth of Forth at a point fifteen miles west of the Forth Bridge and nine miles south-east of Stirling, the bridge has a total length of a little over half a mile. The outstanding feature of the crossing is the swing-span in the centre, which measures 364 feet, weighs 1,600 tons and rotates on a central pier. In the open position the swivelling span allows two clear openings for shipping, each 150 feet in width. Accurate alinement is essential when the span is swung back into the “through road” position. Further, it is necessary for the operator controlling the movement of the bridge to have an indication when this perfect alinement has been obtained. The photo-cell undertakes this task. The impatient screech of a ship’s siren informs the operator that a vessel is waiting to pass. He merely turns the main controlling hand wheel, whereupon the electrical equipment takes complete charge. Traffic lights on the bridge approach roads change to red, warning bells ring, barriers are lowered at either end of the span and the ponderous structure smoothly swings through an angle of ninety degrees. Its return is accomplished with equal simplicity. SAFEGUARD AGAINST INJURY to operators of various machines can be provided by the use of the photoelectric cell. Despite the usual guard rails, in many machines operators must have access to the work. By a system of light-rays focusing on photo-cells, the machine can be instantly stopped as soon as the worker’s sleeve enters the danger zone and interrupts the light-ray indicated by the arrow.